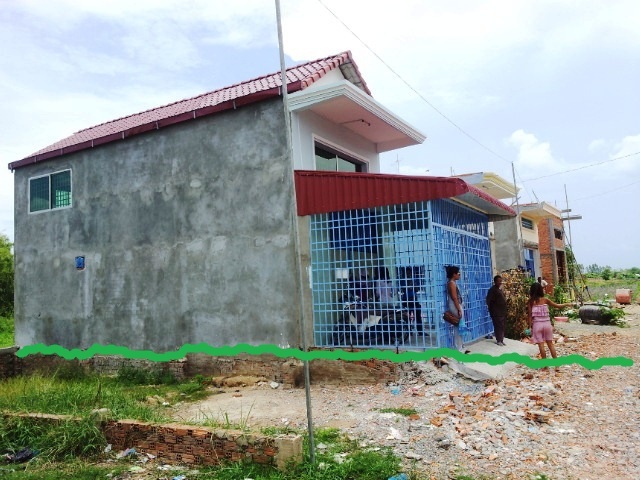 My mother in law has finally sold her patch of land in downtown Kampot. Despite it having some issues with paperwork / titles etc ( long story ), a local lady who is obviously connected ” don’t worry about the paperwork, I’ll sort that out…” coughed up $20,000 which is somewhat less than what mum wanted and what it was probably worth BUT again…with problems attached…it was time to take the money and run. So now mum has $20,000 burning a hole in her pocket and she wants to buy a place in Phnom Penh. Obviously that’s not a lot of money and initially I thought she wouldn’t have a hope in hell but on the weekend we went out house hunting and I can report that you CAN buy places in outer Phnom Penh for $20-25k. Asking $25,000 "but can discount to $23k"
We headed over to Chbar Ampov and a little area just behind Chris and Aya’s house and there we found several houses all under $25k. The house in the photos above was brand spanking new, featured two bedrooms and two WCs ( in the true sense of the word they really were closet sized ) and needed nothing spent on it. The block of land next to it at 4 x 20m was also for sale @ $5000 and would have meant you could add on a nice garden or bbq area / carport etc. There were several other properties of varying nature but same price nearby. However as Tra and I inspect the house closely we could see a very clear watermark running along its side – indeed every house had one. Behind the house was a hug waterway that runs through the area and last year we had huge rains and floods so obviously not a good spot to be in when that happens. I am, pretty sure the residents at this end of the street which dipped away would have been knee deep if they left their houses. Next we visited a “Borey” which are residential developments where the developer buys a tract of land ( in this case swamp ), fills it in with sand and then concretes some roads, wacks on the power and builds as many little row houses as he can. These ones were $23k – $30k for two beds , were quite smart and the first stage had sold out completely. 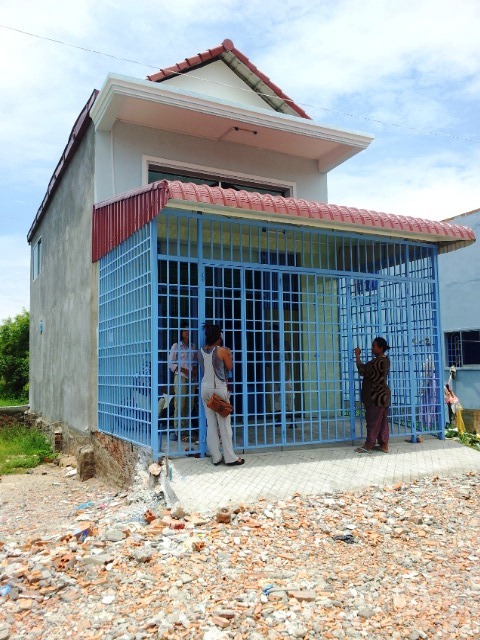 They were building 300 of these houses and with an average of 4 people per house…..that equates to 1200 people living in a little neighborhood without a mini-market etc. Chuck in a dog per household and a few thieves to boot and hey presto…..instant lower socioeconomic slum dwelling for the masses. Maybe I am being a tad harsh but these cheap Borays are horrible IMHO. They lack all of the neighborhood feel that makes Phnom Penh such a cool place to live in. Poor old mum is getting advice from everyone. My advice was to “stick it in the bank, isolate where you would like to live given your budget and then be patient, keep looking and something will pop up….”. So….we keep looking but I rather feel its going to be a stressful time for mum as everyone has an agenda and/or an opinion. 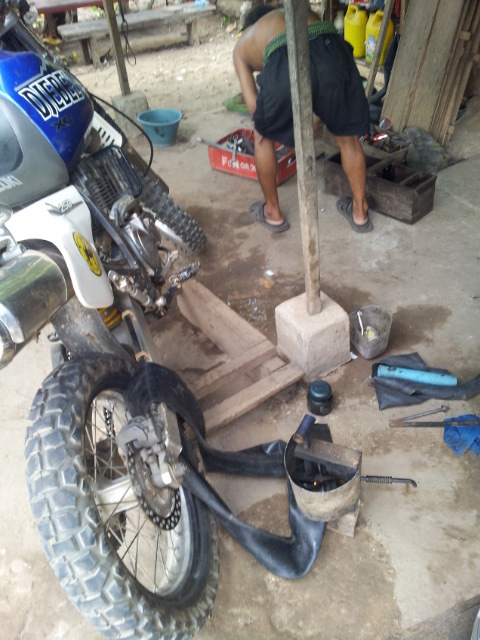 Yesterday after we looked at the house for the second time, everyone else headed out to Kien Svay but I didn’t feel like going so I had ridden the bike. As I headed out of the area the bike felt suspiciously “wrong” and it wasn’t long before I found the problem…a flat back tyre. GREAT ! By now it is 1pm and with an afternoon rain storm coming, it is horrendously humid. Luckily I don’t have to go far to find the nearest tyre repair guy and he gets to work under the shade of a tree in his front year. The village idiot/drunkard approaches me and starts harassing me for money and I smile politely and tell him to shove off. Mr Tyre Man is a little more convincing when he stands up and threatens the chap with a spanner in good humour. Next…. out come the old ladies who want to know all my business. Who am I ? Am I married ? What is my salary ? Do I like Khmer girls and would I like to marry their daughters ?. I look at the daughters who I guesstimate to be about 14 and politely decline. 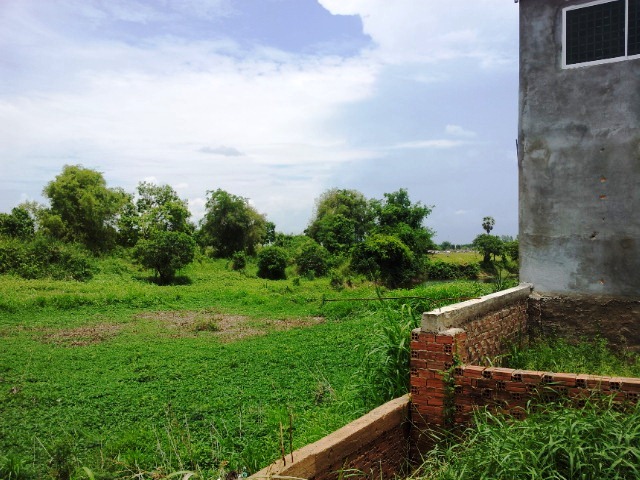 One of them says ” oh you barangs are all rich but us Khmer have no money” to which I reply ” I am not a barang I am an Australian and I am not rich…” to which she replies ” oh but you have a big motorbike you must be rich…” to which I reply “Is this your house ? It is ? Oh …you own a house…..you must be filthy rich then …” to which she shuts her mouth. Meanwhile Mr Tyre Man is doing an incredibly Macgyver-esque repair on the inner tube which has a hole the size of Canada in it. 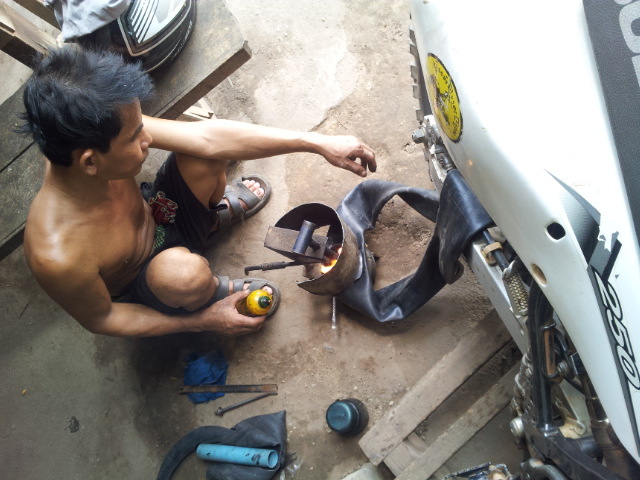 Using a tin can , some rubber and his little kero-powered hot press, he has me on the road in 90 minutes. The cost ? $ 3. I give him $5 and buy him a cold beer. Sterling effort.